On her way back from the North, Violet joins her colleagues and Diethard on an envoy mission for a peace treaty. No title for this episode, which leads me to believe its title is going to be whatever the finale is because this is a two-parter. I think I've figured out what the adaptation is doing with Violet's character development after her acceptance of Gilbert's death. She became ready to accept Gilbert's loss after her contract with the playwright and then dealt with the reality of Gilbert's absence. 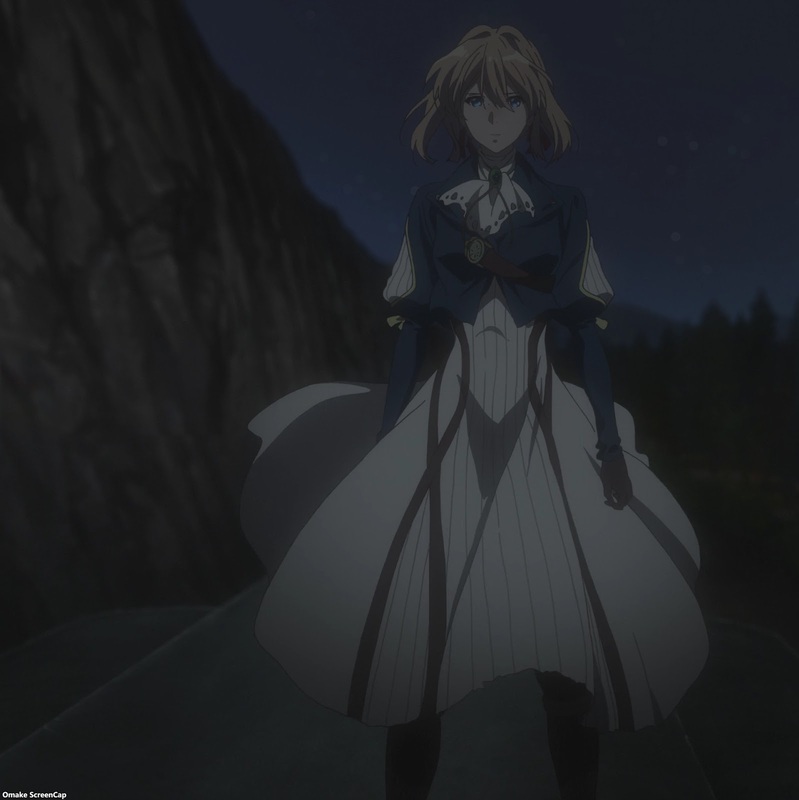 The two episodes afterwards have Violet empathizing with a daughter losing her parent and then identifying with both a soldier who couldn't make it home and his lover who never heard his words of love out loud. The last episode will be the most personal of all - her own guilt at surviving the war while Gilbert did not, and who better to force these feelings to the surface than his own older brother Diethard? I'm still amused at how this continent looks like a squashed Australia. The government officials are making Diethard go after the rebels. Oh. This mission is for the final peace treaty. That's a big metaphor for everyone involved. Leidenshaftlich's only operational special forces come from the Navy since everyone else was stood down after the war. Heh. The reaction from everyone at the mention of Gilbert's name shows what a huge hero he was. It also shows the resentment Diethard has for these guys for taking his little brother away from him. Violet is coming back from her last contract on that plane with the pilot. He was a good guy. Are we finally going to have a Cattleya episode? Crap, Benedict is there too for some reason. These sailors can't take Cattleya's smile. Too much! This bird spreading its wings to cutting to Violet on a plane is way too obvious. KyoAni can do better than this. And Violet is pulled back into military service. Except no killing. Diethard doesn't want to accept her personhood or civilian status yet. Also, I think we're missing the scene where Violet decided not to kill anyone anymore, or at least it didn't register with me. Should have happened at her revisit to the ruins of Intense. Well, that was one satisfying reunion. Decked a jerk! Ouch. Violet saved an enemy soldier about to fall off the train and got slashed along the back for her good deed. This enemy general has some resentment toward the Soldier Maiden. He's torturing her with her own brooch. Diethard has no compunction against killing people. Well, he's still active military and those guys are wearing uniforms. Nah, bro. Violet can't die. The major ordered her to live. I don't know about the not killing part; that's her deal, but definitely she needs to live. Diethard had a moment of recognition for Violet's grief and regret. He's actually starting to see her as a person. He may actually start moving toward forgiving her and himself for surviving the war. Well, thank goodness Violet has metal arms. Much easier to block rocket grenades that way. Without that final battle and Gilbert saving her life, she couldn't be there on that train to save Diethard's life. Next time, get ready for all the hits right to the feels.